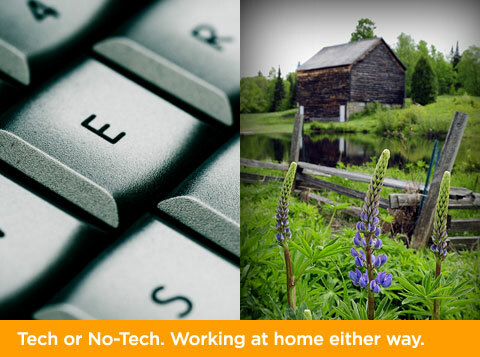 Technology is making it easier every day for a lot of people to work from home. Personally, I run a graphic design business. 10 years ago we had an office in San Diego, clients in San Diego and employees from San Diego. Now, with broadband Internet so widely available we closed the office, have clients all over the country and designers from Baltimore to Buenos Aires. The easiest way is to create a business where you work with your brain, not your hands. It’s much easier to be home based or even mobile. However, there are a lot of people who have created product based businesses that outsource production and fulfillment. Finally, don’t get stuck thinking you need to pick ONE business to support yourself. While I make the majority of our income from my design business, I also make money doing photography, Mac consulting, some investments and of course Family Hack. I really enjoy the variety too. It makes life interesting and I’m always learning new things. Of course, technology doesn’t always have to play a part. Last year, a friend of mine lost his SysAdmin job. Instead of looking for another job, he and his wife decided to make a change. They moved to a less expensive house about 30 minutes outside of town. It sits on several acres that they’ve turned into a “farmette”. They grow their own produce, and raise chickens (and eggs) for sale at the farmers markets. They also opened a dance studio nearby that teaches kids and adults. You can see more info at Sweet Dog Farm and Dance Barn. Thanks for the response. Although I’m still employed with a solid company I’m looking for ways to transition to a home based business. As a first timer I have found it difficult to work through the legitimate vs sites that just want you to fund something that may or may not work…. I agree. The filtering is tough. There is so much get rich BS in the work at home industry. You might want to read Tim Ferriss’ The 4-Hour Workweek . There is a fair amount of hyperbole, but also some good info on how to set up businesses that are scalable and less location based. Don’t let the title put you off, It’s just for marketing. The book isn’t about getting lazy. It’s about working smart. Another idea is to start a business that can use your “solid company” as a first client/customer. I did that when I first started. I worked in a corporate art department. I left only after I knew they would be my first client. It was essentially the same job. The only difference was I did it from home, they weren’t locked in to paying me and I invoiced instead of getting a paycheck. In return I got the freedom and over the next couple of years added new clients. Being inside the company gives you great access to seeing what they might need. If you can find a way to fill that need you can create a new business for yourself with very little risk. You essentially have a deal before you leap….